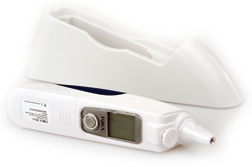 The FORA IR20 Ear Thermometer provides an easy to use, fast and accurate temperature measurement in an attractive package. Probe cover detection and ejection. Large memory capacity up to 10 results. Battery life with more than 1000 measurements. Bluetooth connectivity to transfer results to a mobile device or personal computer.